Vintage bronze style plating engraved Alloy case, unique magnifying glass design helps you read the time more efficiently. The skeletal inner dial shows off the gears and inner workings of the watch at all times. Its automatic movement winds with the movement of your arm. The Best quality automatic movement for pocket watches available in China with impressive finishing. Power this watch by automatically winding the crown, which tightens the mainspring and stores energy to keep the movement running smoothly. This timepiece is the best gift to record wedding day or valentines-day for your love, Christmas present for son or grandson, anniversary gift on father's day, cool birthday gift for a bosom friend, graduation gift for the beloved, a great souvenir for anyone, even a perfect decoration for the room. 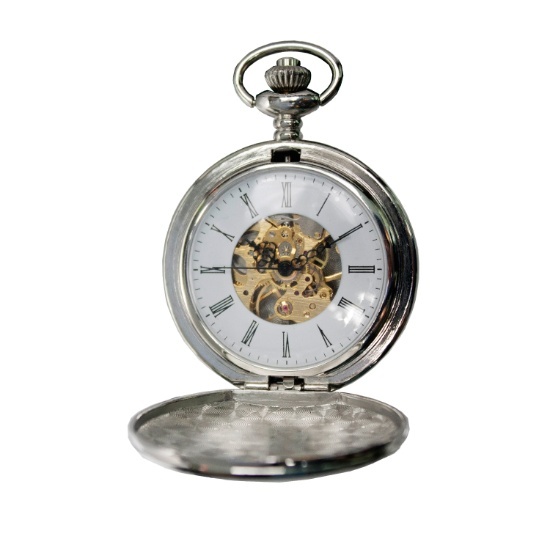 This cool pocket watch is no doubt perfect good stuff on the everyone's shopping list or wish list.